Hey, Mato! It’s me, Foffano, the brazilian guy translating EarthBound and MOTHER 3. I just posted on Earthbound Brasil what I got for Christmas gift. 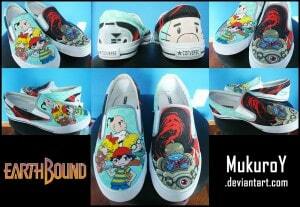 A pair of EarthBound shoes that my sister painted for me. They’re awesome! 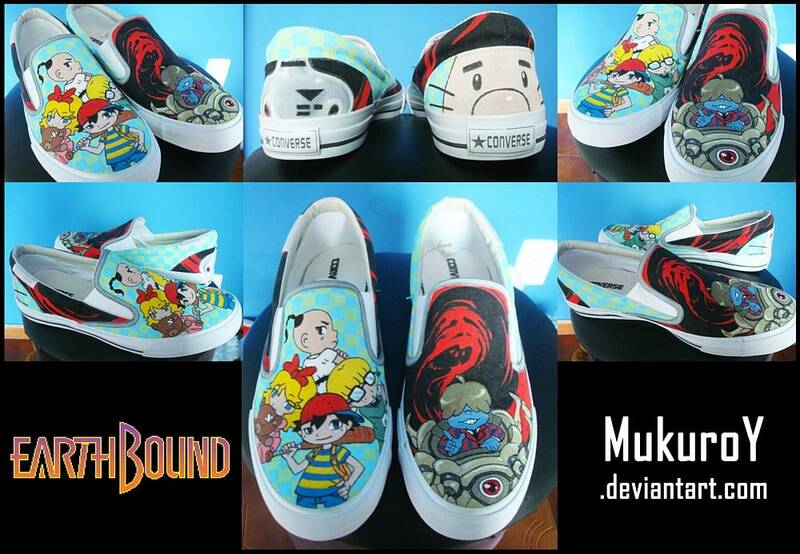 At first I thought they were those special EarthBound shoes that were entered into that Jones soda contest. These ones look really awesome, I’d probably wind up using them as a decoration than as shoes. Anyway, if you haven’t before, check out EarthBound Brasil sometime – even if you can’t understand the language, it’s really cool seeing other active EarthBound sites, especially ones from around the world! These look really neat. I wonder if one day they’ll be a rare collectable like an EB0 prototype. What I’d do for a pair! 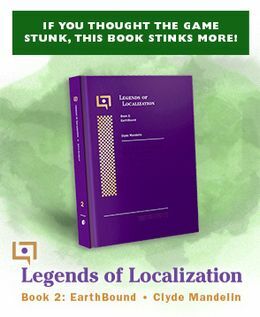 Have the Fangamer guys given any thought to making something like this? Seems like it could be a decent product if the technical hurdles (not just licencing — having to stock a range of shoe sizes is hurdle enough for anyone) could be overcome. It would be sweet if there were some fangamer socks. Those could very well be the coolest shoes that ever existed. Awesome. I’m in love with the sheer detail on it. These have eventually are going to get rare, these are so phenomenal I would were them everywhere, and I mean everywhere!